The national and international attention caused by the furore around the Spear of the Nation turned Smear of the Nation has made all other current exhibitions pale into insignificance. While Goodman Gallery has removed the offending work from the show, the rest of Hail to the thief II can be seen until the 16th June. Exhibitions at other galleries on the Jan Smuts art strip include Cloth and Clay at Kim Sacks and William Kentridge’s Universal Archive (part 24 -37) at David Krut. Cloth and Clay is an exhibition of porcelain by Katherine Glenday, and indigo textiles by Aboubakar Fofana. It runs until 16th June. The Universal Archive linocuts began with Kentridge making a series of small ink drawings. These images were then evetually photo-transferred to linoleum plates. The more gestural mark of Kentridges’s ink drawings is in contrast to the more conventionally heavier mark traditionally associated with the medium of linocuts.Moving further north at Circa Between Rock – grinding stones from southern Africa showcases 100 Iron Age grinding stones from Limpopo. The exhibition is curated by Prof Tom Huffman (Wits Archeology) and Prof Karel Nel (Wits Fine Arts) and runs until 16 June. The gallery is open Mondays to Fridays from 9am to 6pm, and Saturdays from 9am to 1pm. Showing at the Everard Read until the 16th June is Nicky Leigh’s work Visions of Eden African landscapes. Pierneef meets Leigh Voigt in these decorative two-dimensional renderings of cattle filled landscapes. 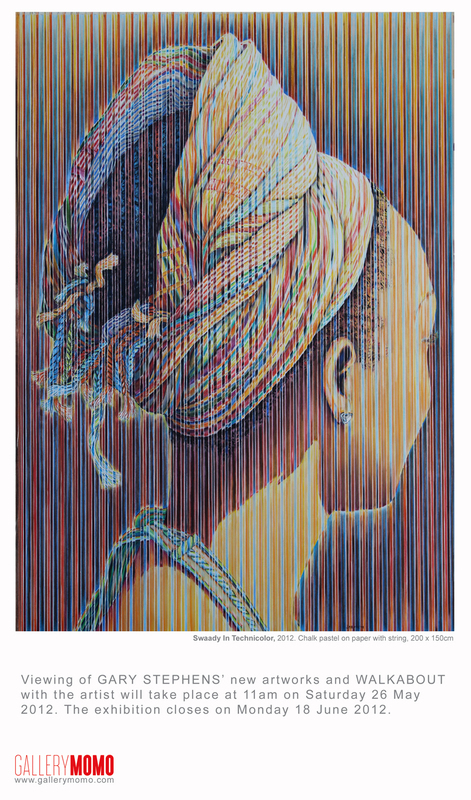 Gary Stephens shows at Momo in 7th Ave Parktown North until 18th June. Seen here is one of his works in chalk and pastel on paper with string. In Birdhaven at In Toto an exhibition entitled The Other World in collaboration with Otto De Jager runs until the 3rd July. To catch Nandipha Mntambo’s exhibition at the Standard Bank Gallery you’ll have to get there by Saturday 9th, when the show closes. Mntambo the Standard Bank Young Artist Award winner works with grotesquely exquisite renderings of cow hide moulded into clothing. Interesting review by Mary Corrigall in Sunday Independent Life 3rd June. Anton Kannemeyer Paintings for Doctors and Dentists shows at Stevenson’s Gallery in Braamfontein until 9th June. While Kannemeyer often produces work that makes biting comment on middle-class values, the works on this show are rather of the kind that ‘doctors and dentists’ might actually want to hang in their houses. Also closing on 9th June is Wilhelm Saayman’s King for a Day at Arts on Paper (AOP) at 44 Stanley Auckland Park. Saayman makes reference to street art, outsider art and to the tradition of artists like Basquiat. An unusual venue for an art exhibition is the Adler Museum of Medicine at Wits Medical School campus in Parktown. Currently showing until 30th June is Meeting the Makers, curated by the Tatham Art GAllery and showing work by a wide ranfge of crafters from complete unknowns to well known artists.